An alarming increase in anti-biotic resistant viruses, staph infections and life-threatening strains of influenza have surfaced in recent years, prompting Western medicine to join its Eastern counterpart in raising public awareness about the importance of strengthening the immune system in order to avoid falling victim to these pernicious threats to our health. According to medical experts the war against previously unknown viral diseases, pathogenic microorganisms and environmental pollutants, is one of the most serious health issues faced in modern times. The strategy of increasing our immunological defenses in order to avoid becoming sick thus eliminating the need for curative treatment, is not coincidentally the most fundamental guiding principle of the 5,000 year-old traditional Chinese medical system. Dating all the way back to the second century when it was first mentioned in the Ben Cao Jing an herbal treatise written by the creator of Chinese Herbology, the Emperor Shen Nong. 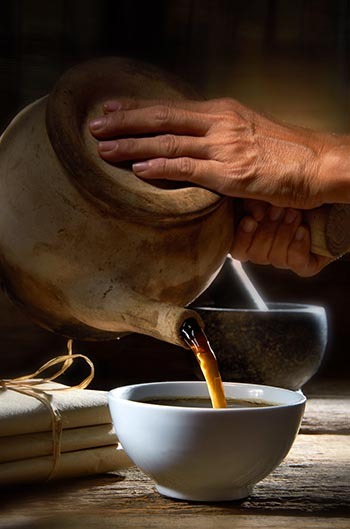 The herb Ling Zhi Cao, aka Ganoderma or Reishi Mushroom has enjoyed the veneration of the Chinese people for its immune enhancing properties, which are known to increase white blood cells and stimulate the production of antibodies that are essential to protecting our bodies against pathogenic invasions. In addition to its extensive use in Chinese medicine, the wild Chinese mushroom Ling Zhi Cao’s extraordinary ability to nourish and strengthen the immune system (what the Chinese call the Wei Chi), has garnered the attention of Western medical science in its search for a viable treatment for patients who suffer from auto-immune deficiency (AIDS/ HIV). In fact, Ling Zhi Cao is by some estimates the most powerful immune system strengthening botanical ingredient in both Eastern and Western Herbology! This raw Chinese herb is sold whole by the pound in either raw or powdered form. Please use the .. This patent pill formula is sold in two sizes—choose from—one bottle of 100 pills (that’s a 15-day s.. This immune system enhancing pill formula is sold in two sizes—choose from—one box of 100 pills (tha.. This immune system support prescription is available in pill formula and is sold in two sizes—choose..